The 1987 Division 1-AA National Championship team was honored today as the Warhawks wore their new throwback uniforms sporting the new school logo on their helmets. They also honored the championship team by beating Coastal Carolina in a shootout, 51-43. 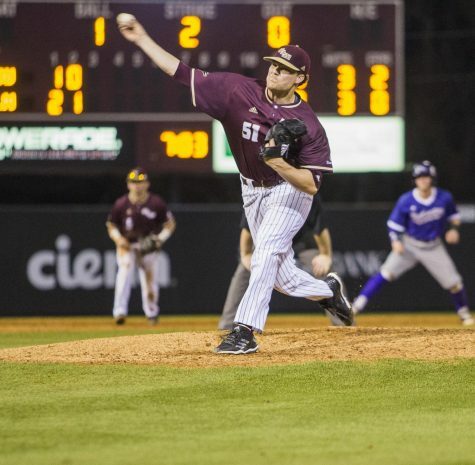 The Warhawks are 2-2 overall and (2-0) in conference making this the best start in the Sun Belt since the 2013 season. 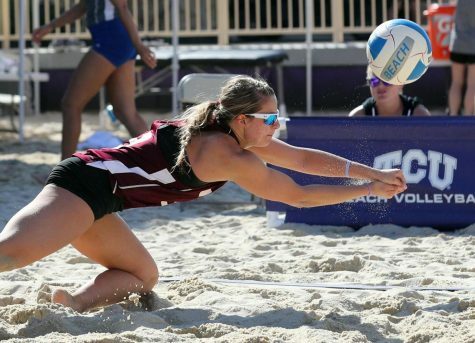 Head coach Matt Viator said the turnover factor was what kept the team in the game. 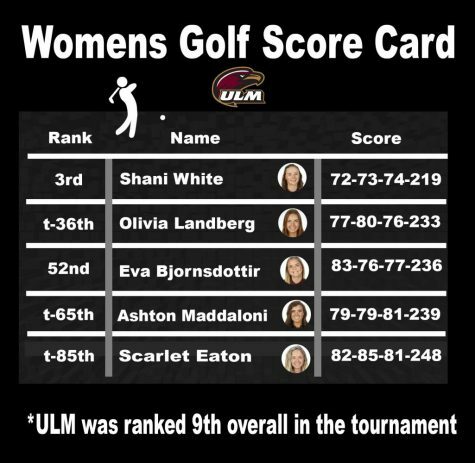 The Warhawks came out flat in their first drive of the game, but the drive ended in three points, but the score put ULM ahead. Coastal Carolina quickly answered by capping off a four-play, 98-yard touchdown drive with an 83-yard strike to take the lead 7-3. 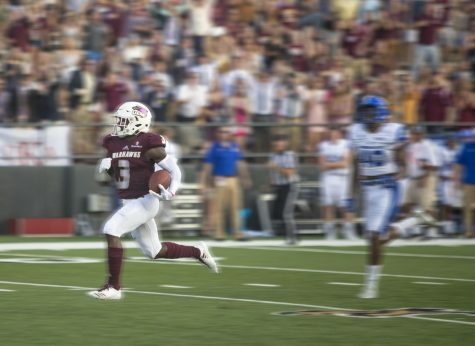 The Warhawks’ special teams managed to hold their blocks as junior receiver Marcus Green raced down the sideline and beat the kicker as the last line of defense for an 82-yard kickoff return. This effort by the special teams put the Warhawks in the lead 10-7. 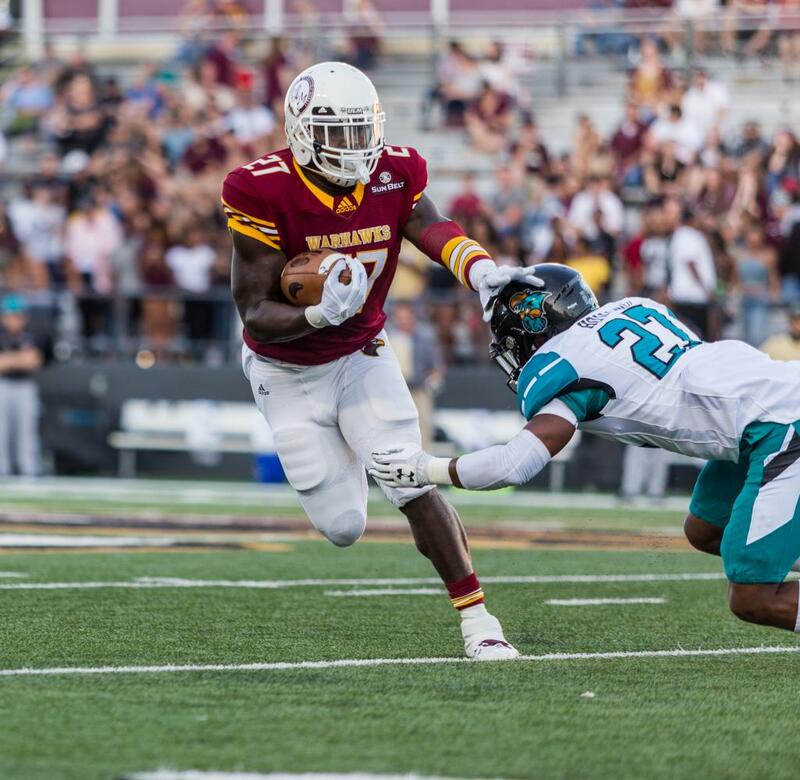 ULM gave up another long scoring drive from the Chanticleers as they completed a seven-play, 85-yard drive capped off by a 27- yard touchdown reception. 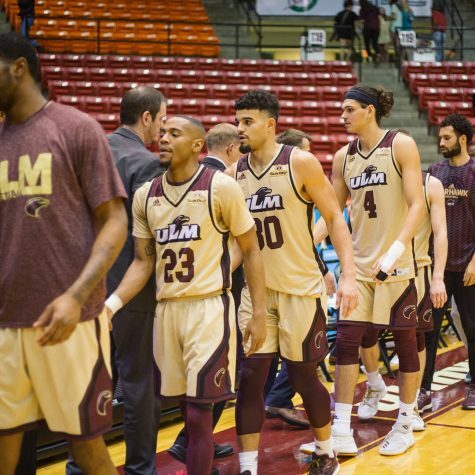 ULM looked lost in the secondary as Coastal found many holes in the defense. The team is without two starting safeties in sophomore Luke Hedrick and sophomore Nick Ingram to injury. The Warhawks slowly found their groove on offense by executing an eight-play, 75-yard drive on a one-yard run from junior running back Ben Luckett. 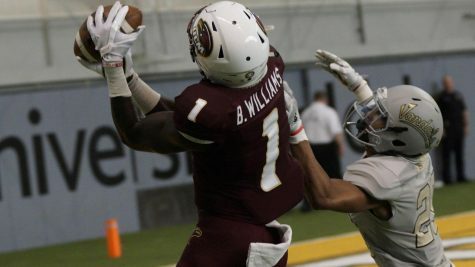 The Chanticleers were looking to exploit the Warhawks secondary once again, but senior safety Roland Jenkins came down with a key interception. The Warhawks quickly capitalized off the turnover, scoring on a two-play, 15-yard drive with a touchdown run from senior running back Derrick Gore putting the Warhawks up 24-15 with 11 minutes left in the second quarter. The shootout continued as the Chanticleers scored on a seven-play, 68-yard drive exposing our secondary cutting the Warhawks’ lead to just two (24-22). On the following drive, the Warhawk defense came up with another key turnover. Sophomore linebacker Chase Day picked off a pass from Coastal Carolina which helped put the Warhawks in the red zone. 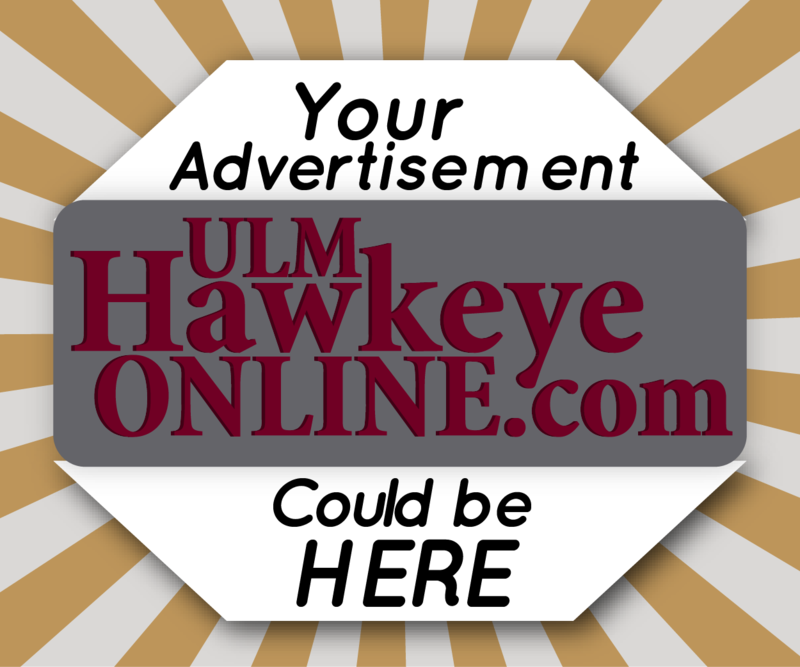 ULM quickly scored off a 27-yard touchdown pass from sophomore quarterback Caleb Evans to junior tight end Sloan Spiller, putting them ahead 31-22. The Warhawks opened the second half with a bang, with a 56-yard run from Luckett which stretched the lead by 16 points (38-22). Luckett finished the game with seven carries, 129 yards and two touchdowns. “We just have to continue to work and be productive. 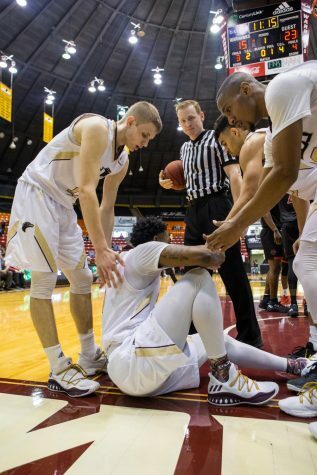 It was a great feeling to be back on the field and producing at a high level,” Luckett said after the game. 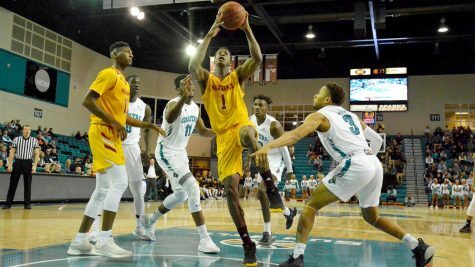 ULM eventually closed out the game on a defensive stand in the final minutes, escaping a furious comeback effort from the Chanticleers. 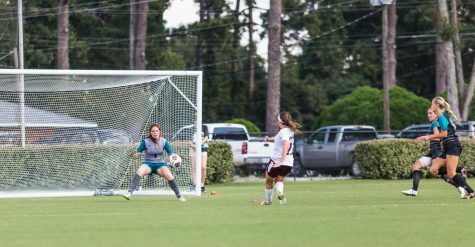 The Warhawks will be back in action on the road against Texas State with kickoff set for 2 p.m. this Saturday.